Loungers may recall my asking for volunteers a couple of months ago to get involved with the Ymedaca project at the magnificent Yorkshire Sculpture Park later this year. We’ll be working alongside other groups from the area, including the Cantabile choral group, Hand Tools Users United, The Royal British Legion, Wakefield Pagan Moot, West Yorkshire Astronomical Society and the Yorkshire Sun Society. Plans are progressing nicely within the core Magick Lounge group (which is basically me and Andy Cooper, so far). Others are now beginning to show an interest, having presumably managed to overcome their aversion to their world of magic becoming embroiled (tainted?) with that of art… I’m particularly pleased that our favourite special effects friend Jared Manley has agreed to help out with certain aspects of fiery ritual sacrifice. The photograph above is montage of three pics I took during the shoot. Not great quality but I think they give an idea of the atmosphere. The lower and top right pics show a couple of the locations. The top left pic is of the entrance to the cafe area where we repaired from time to time for hot drinks and sandwiches while the shots were being set up. This was quite a complex job with seven ‘guardians’, a Platonic solid (some of which turned out to be a little less than solid…), and the reclining artist having to be arranged and lit appropriately. Each took up to an hour to set (we were there from 5:30 until nearly 11:00 p.m.), but we did have stand-ins (Sheffield Hallam students) for the main characters so we could skive off for the aforementioned warming drinks if we wished. It was a fascinating, educational and most enjoyable evening working with the photographer (sorry, can’t recall his name at the moment), the Sheffield Hallam crew, and of course the artist, Hester Reeve. Perhaps I can persuade Andy ‘primary-bed-wrangler’ Cooper to add his comments? And do talk to me or Andy if you’d like to take part. It was a really fun and interesting way to spend an evening. I love the Yorkshire Sculpture Park and getting to roam through it at night was a wonderful experience. The sculptures appeared out of the darkness or shone their light across the site (the running horse was particularly memorable). 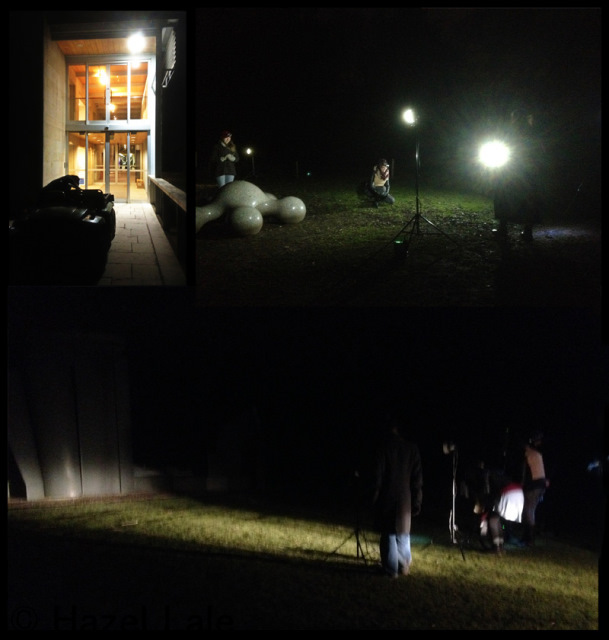 What was great was how quickly the group went from not knowing each other to working as a well oiled machine, taking down the lights and props, moving to the next location, setting up the equipment and getting the shot. I really thought we would be there until very very late, as it was we finished by 11pm. Jonti was the name of the photographer and from what I saw in the tiny screen on his camera the photos will be very special. I did indeed drag a bed with a lightning conductor attached across the entire site (with help from the students), you need to see the pictures to understand why. The whole event in August is going to a lot of fun, if you want to get involved get in touch. We do need someone with a vulture! PS It doesn’t have to be a cultured vulture, despite this being a YSP event…. We appreciate you the particular great writeup. This process was previously your enjoyment account the item. Appearance intricate to be able to more shipped reasonable on your part! Nonetheless, what exactly is communicate? Thanks for your comment. What is communicate? Clearly it means different things to different people. For me an important aspect is to be able to construct a sentence in such a way that the meaning is clear to the intended recipient. I see that you may have a different interpretation. Do tell me more so that I am better able to process — or perhaps become aware of — my previous enjoyment.